Car Cleaners, Car Scent, Automotive Cleaning Cloth, BackJoy! • BackJoy Posture+: Maintain your vitality by sitting with BackJoy Posture+. Posture+ is not a simple cushion. Designed with APS™ Technology and Advanced Core materials so you can automatically sit with ideal sitting posture, anytime, anywhere. And with the impact absorbing, all-conditions skin you can sit from the office chair to a rock hard surface with greater comfort, longer. Helps boosts best posture and involves core muscles so you can sit more comfortably, and correctly, to get more out of life. One Size Fits Most Fits 120-300 Lbs (22-135 Kg.). Comfortably. So Easy! You sit on top of Backjoy and it works to support you on hard or soft surfaces giving you...relief! Works Anywhere. Easy To Use. No Straps. Doctor Recommended. FDA Registered Medical Device. Great for the Car, Work & Office, Home, Traveling. Made of all new material consisting of Urethane Foam 100%. Measures 16.5 x 4 x 12.8 inches. Black / Orange / Hot Pink / Red / Yellow. 1 pc. ORDER NOW! HOW IT WORKS: 1) Our patented Applied Postural Science (APS™) corrects your posture -- Our APS Technology automatically tilts, cups, and floats your pelvis upright so you can find your most balanced and comfortable posture. 2) Posture+ naturally maintains your posture while you sit -- You move when you sit – so Posture+ moves with you - freeing your pelvis to actively stabilize your spine. It automatically adapts to your movements to provide constant strain free comfort and optimal posture; and you won't have to even think about it. 3) BackJoy engages your core muscles -- When you sit your core is not engaged. Posture+ dynamically supports your pelvic floor to engage your core. With natural balance and support, you will feel comfortable, stronger and less tired after sitting for long periods of time. • BackJoy Core Relief: BackJoy Relief is a portable back orthotic that alleviates and prevents back pain by automatically correcting sitting posture. 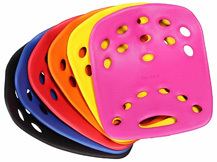 The ground-breaking and scientific design of BackJoy's Orthotic Cradling System™ allows BackJoy Relief to 'float' the user's spinal system over any sitting surface, hard or soft, for all-day comfort and injury prevention. It is dynamic and responds to the way your body moves, allowing your spine to sit in proper alignment – so you won't hurt. Its three-part design tilts, cradles, and lifts your pelvis to attain perfect posture and a pain-free back. Holds individuals up to 300 lbs. Comfortably. So Easy! 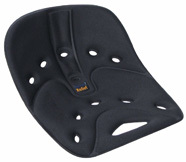 You sit on top of Backjoy and it works to support you on hard or soft surfaces giving you...relief! Works Anywhere. Easy To Use. No Straps. Doctor Recommended. FDA Registered Medical Device. Great for the Car, Work & Office, Home, Traveling. Made of all new material consisting of Urethane Foam 100%. Measures 16.5 x 4 x 12.8 inches. Black. 1 pc. ORDER NOW! • Glass & Chrome Cloth: Used after cleaning the car, the Glass & Chrome Cloth leaves glass, chrome and bright body parts sparkling and smear free. The Glass and Chrome Cloth's advanced microfibers can potentially remove wax/polish from the car body, especially residue that would harbor dirt and bacteria. It will not remove or impact the protective paint finish. Glass and Chrome Cloth – 20" x 16". 80% Polyester / 20% Polyamide. 1 pc. ORDER NOW! • Car Cleaning Kit: The perfect solution for keeping your car clean and sparkling. The three products in the Car Cleaning Kit and water are all you need to quickly clean, dry and shine your whole car. e-auto products are so powerful, they can clean using just water. They will also perform well with a small amount of your regular cleaning liquid. Using e-cloth's unique fiber technology with water, they break up and hold dirt, grime and grease which normal cloths leave behind. The advanced microfibers used to make the e-auto products can potentially remove wax/polish from the car body, especially residue that would harbor dirt and bacteria. It will not remove or impact the protective paint finish. All products 80% Polyester / 20% Polyamide. 3 pc. ORDER NOW! Kit includes one (1) each: Dual Action Mitt - 10" x 6.75", Dry & Shine Cloth - 16" x 24", and Glass & Chrome Cloth – 20" x 16". e-auto Dual Action Mitt's Orange "soft-fingered" side will quickly handle all the tough initial cleaning and get into hard to reach areas. e-auto Dual Action Mitt's smooth grey side is for general and spot cleaning. e-auto Dry & Shine Cloth is used after the e-auto Dual Action Mitt - use dry on the wet body, glass and shiny surfaces for the perfect water mark free, polished finish. Cleaning power of the fibers removes any residues of grease and grime and is effective on all surfaces: body, lights, glass and chrome. e-auto Glass & Chrome Cloth produces a perfect smear-free, lint-free and polished finish on windshields, glass, chrome and mirrors using just water. Glass & Chrome Cloth, 1 pc. Car Cleaning Kit, 3 pc. AUTO CARE: Glass & Chrome Cloth 1 pc. 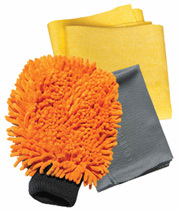 AUTO CARE: Car Cleaning Kit, 3 pc. Odor Eliminating Air Freshener: Eliminate odors on contact with Citrus Magic Odor Eliminating Air Freshener Sprays. Made with 100% Active ingredients of pure and natural citrus oils, Citrus Magic sprays last up to 4X longer than conventional air fresheners that are mostly made of water, gas and a little perfume. One spray of Citrus Magic and you will immediately notice the difference! With the concentrated formula, you will see how much a little bit can go a long way. Enjoy the magic of citrus by spraying Citrus Magic in your HOME, OFFICE, or CAR. Perfect for Smoke Odors, Pet Odors, Bathrooms, Food Odors, Litter Boxes, Sinks, Carpet Odors, Garbage Cans, Drains, Musty Smells, Garbage Disposals, Mildew Odors. • Odor Eliminating Air Freshener Tropical Citrus: Refreshing tropical citrus fragrance. Non-Aerosol. 3.5 oz. ORDER NOW! • Odor Eliminating Air Freshener Tropical Orange: Fragrance of freshly squeezed oranges. Non-Aerosol. 7 oz. ORDER NOW! • Odor Eliminating Air Freshener Tropical Lemon: Clean, fresh and cheerful aroma. Sparkling and invigorating summer fragrance. Non-Aerosol. 3.5 oz. ORDER NOW! • Odor Eliminating Air Freshener Tropical Lime: Zesty, fresh and full of energy. Non-Aerosol. 3.5 oz. ORDER NOW! • Odor Eliminating Air Freshener Pink Grapefruit: Exciting, wake-me-up citrus delivers a splash of freshness. Non-Aerosol. 3.5 oz. ORDER NOW! • Odor Eliminating Air Freshener Fresh Orange: Sweet. Juicy. Fresh notes of Orange. Non-Aerosol. 3.5 oz. ORDER NOW! • Odor Eliminating Air Freshener Lemon Raspberry: A pleasantly fresh, tangy mix of Raspberries and Lemon. Non-Aerosol. 3.5 oz. ORDER NOW! INGREDIENTS: 100% Pure & Natural, Premium Concentrate citrus fragrance oils from Oranges, Lemons, Limes, Tangerines and Grapefruits. AUTO CARE: Odor Eliminating Air Freshener, 3.5 oz. AUTO CARE: Odor Eliminating Air Freshener, Tropical Orange 7 oz. Sanitizing Towelettes: Clean up, wipe up, and lift up your spirit with towelettes drenched in organic essential oil. They are lightweight, soft, and antibacterial. These germ killing towelettes are ideal for hands, face, feet, and legs. Travel pleasantly. Use in trains, planes and automobiles. Car not as fresh as you'd like? Freshen up with a swipe at the vent. Freshen hands after fueling your vehicle. Keep towelettes in purse, glove compartment, backpack, wallet, diaper bag, locker, or anywhere you can grab one. • Refresh Towelettes Grapefruit Splash: Grapefruit oil energizes and refreshes. 20 individually wrapped towelettes/Bag. 8 X 6 inches. ORDER NOW! INGREDIENTS: Simmondisa Chinensis (Jojoba) Oil, Tocopheryl Acetate (Vitamin E), Polysorbate 20, Phenaxyethanol, citric Acid. • Relax Towelettes Lavender Calm: Lavender oil soothes and relaxes.20 individually wrapped towelettes/Bag. 8 X 6 inches. ORDER NOW! 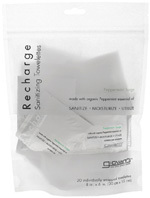 • Recharge Towelettes Peppermint Surge: Peppermint oil awakens and recharges. 20 individually wrapped towelettes/Bag. 8 X 6 inches. ORDER NOW! 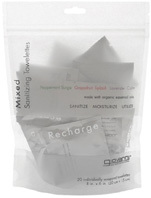 • Mixed Towelettes Peppermint Surge/Grapefruit Splash/Lavender Calm: Assorted 20 individually wrapped towelettes/Bag. 8 X 6 inches. ORDER NOW! AUTO CARE: Sanitizing Towelettes, 20 Count/Bag. • Car Breeze Essential Oil Diffuser: GreenAir Car Breeze Aromatherapy Diffuser gently disperses in your car with essential oil aroma that will help freshen your senses. It features an extra USB so you can charge your phone while preparing for a new day. The Car Breeze is sure to ease your daily commute. 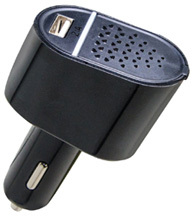 Fits standard vehicle 12V socket, Power: 5V DC, Misting Modes: Continuous/Off, Coverage: Up to 100 sq. ft., Run Time: Continuous. 3pc Refill Pads included (additional replacement pads available for purchase separately). Black. Measures 2" x 1" x 4". ORDER TODAY! • Car Breeze Essential Oil Diffuser Refill Pads: 10 Refill Pads. For best results, use a new car diffuser pad when switching oils. ORDER NOW! AUTO CARE: Car Breeze Essential Oil Diffuser Refill Pads, 10 ct.
AUTO CARE: Car Diffuser Refill Pads, 10 ct.
Room & Body Mist: Conatins a unique blend of our 100% pure essential oils that provide true aromatherapy benefits for the mind, body and spirit. Provides a natural alternative to synthetic air freshners. Use them on the kitchen, bathroom or even at the office. Packaged in a convenient and portable aluminum can that is great for travel, storing in your car or even in your purse. • Room & Body Mist Relaxing Lavender: (calming & relaxing) Like awakening with the delightful aroma of a freshly-gathered bouquet of flowering Lavender. Relaxing Lavender will soothe the senses, purify the body and balance the spirit. 4 oz. ORDER TODAY! • Room & Body Mist Peaceful Patchouli & Sweet Orange: (love, peace & hapiness) Peaceful Patchouli & Sweet Orange Mist transports you back in time with the free-spirited blend of Patchouli and elevating Sweet Orange essential oils. 4 oz. ORDER TODAY! Ingredients:Water (Aqua), Citrus Sinensis (Sweet Orange) Oil, Citrus x Limon (Lemon) Oil, Pogostemon Cablin (Patchouli) Oil. • Room & Body Mist Refreshing Tangerine & Grapefruit: (refreshing & awakening) Like breathing in the delicious and zesty-sweet aroma of a tall glass of freshly juiced Citrus. Refreshing Tangerine & Grapefruit Mist will gratify the senses, uplift the body and revitalize the spirit. 4 oz. ORDER TODAY! AUTO CARE: Room & Body Mist, 4 oz. All Purpose Home Care Wipes: All Purpose Home Care Wipes provides convenience and natural cleansing power now blended into one ready-to-use all-purpose wipe. Easily wipe away dirt and grime with these biodegradable, septic safe, durable wipes. Use in Kitchen, Bathroon, Dining Room, or Garage. Keep a pack in the car for spills on the road! Lemon scented. 35 Wipes. ORDER TODAY! INGREDIENTS: Water, Ethanol (corn derived), Decyl Glucoside (plant-deriver surfactant), Cocamidopropyl Betaine (plant-derived surfactant), Glutamic acid N, N-diacetic Acid Tetradodium Salt (naturally-derived biodegradable chelate), preservative, fragrance (contains natural oils, citric acid (food-grade). All Purpose Home Care Wipes 35 ct.